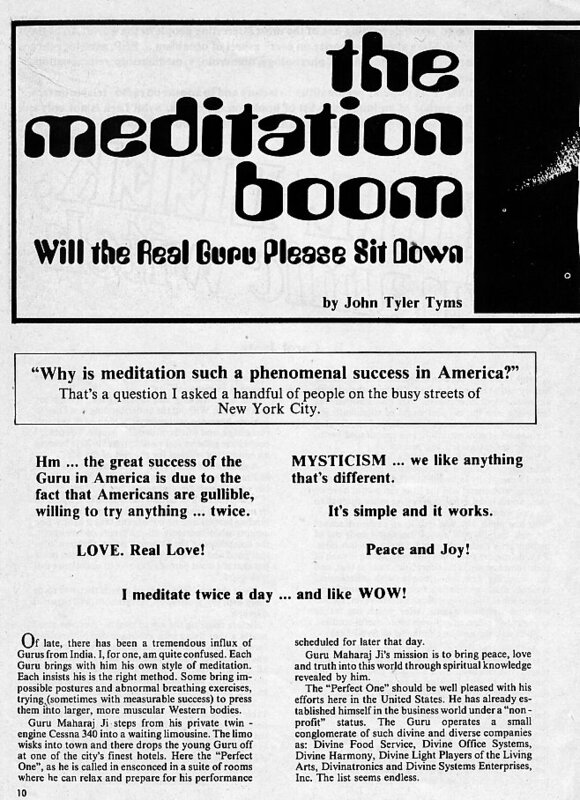 "Why is meditation such a phenomenal success in America?" That's a question I asked a handful of people on the busy streets of New York City. willing to try anything … twice. MYSTICISM … we like anything that's different. I meditate twice a day … and like WOW! Of late, there has been a tremendous influx of Gurus from India. I, for one, am quite confused. Each Guru brings with him his own style of meditation. Each insists his is the right method. Some bring impossible postures and abnormal breathing exercises, trying (sometimes with measurable success) to press them into larger, more muscular Western bodies. Guru Maharaj Ji steps from his private twin engine Cessna 340 into a waiting limousine. The limo wisks into town and there drops the young Guru off at one of the city's finest hotels. Here the "Perfect One", as he is called in ensconced in a suite of rooms where he can relax and prepare for his performance scheduled for later that day. Guru Maharaj Ji's mission is to bring peace, love and truth into this world through spiritual knowledge revealed by him. The "Perfect One" should be well pleased with his efforts here in the United States. He has already established himself in the business world under a "non profit" status. The Guru operates a small conglomerate of such divine and diverse companies as: Divine Food Service, Divine Office Systems, Divine Harmony, Divine Light Players of the Living Arts, Divinatronics and Divine Systems Enterprises, Inc. The list seems endless. Back at the hotel … the time has come for the "Perfect One" to appear before his followers. In a municipal hall filled to capacity, the Maharaj Ji sits enthroned above a huge sea of ardent followers. They listen attentively as the fifteen - year - old perfect master speaks into a battery of microphones. Unknown to those gathered in the hall is a fiendish, yet gentle, interloper whose purpose in being there is to prove whether or not the "Perfect One" is mortal. Carefully he moves among the crowd, working his way toward his unsuspecting victim. "I am the source of peace in this world. All I ask of you is your love. All I ask is your trust. And what 1 can give you is such a peace as will never die. I declare 1 will establish peace in this world. But what can I do unless men come to me with love in their hearts and sincere desire …"
SPLAT! The "Perfect One" is socked in the face with a cream pie. The beginning of a bad cycle? Several weeks pass; the Guru is stricken with violent stomach pains. He is rushed to a hospital. The diagnosis: peptic ulcer. A Guru with an ulcer? Seemingly impossible. Surely the "Perfect One" has reached a higher level of consciousness to be able to transcend such inner physical ailments. What about tranquility, peace of mind? He's only fifteen and burdened with a young business executive's ailment like ulcers. Perhaps the "Perfect One" should visit the Maharishi Mahesh Yogi. How can one help but wonder if the marvels of the mystical Indian Vedas have been corrupted by capitalism? Across the country to the east, in a small hundred acre estate just north on Nyack, N.Y., Robert Masters and Jean Houston operate a research center for mind expansion called "Foundation for Mind Research". 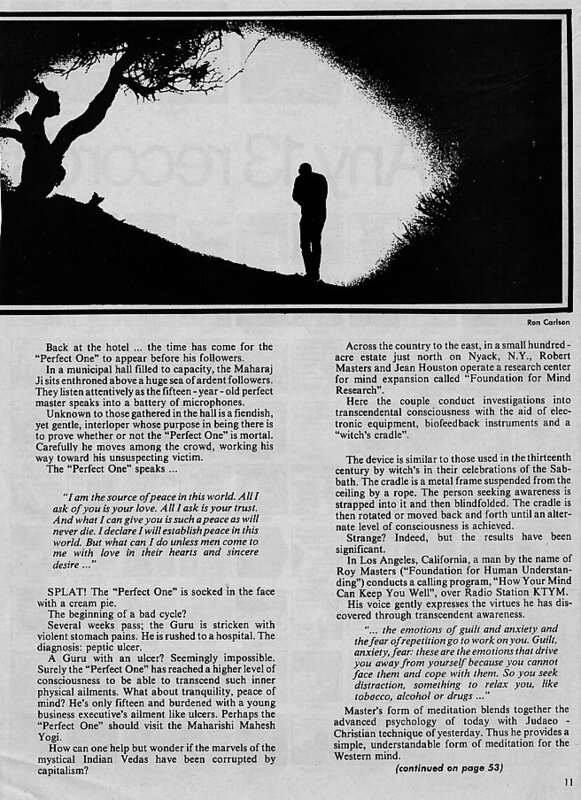 Here the couple conduct investigations into transcendental consciousness with the aid of electronic equipment, biofeedback instruments and a "witch's cradle". The device is similar to those used in the thirteenth century by witch's in their celebrations of the Sabbath. The cradle is a metal frame suspended from the ceiling by a rope. The person seeking awareness is strapped into it and then blindfolded. The cradle is then rotated or moved back and forth until an alternate level of consciousness is achieved. Strange? Indeed, but the results have been significant. 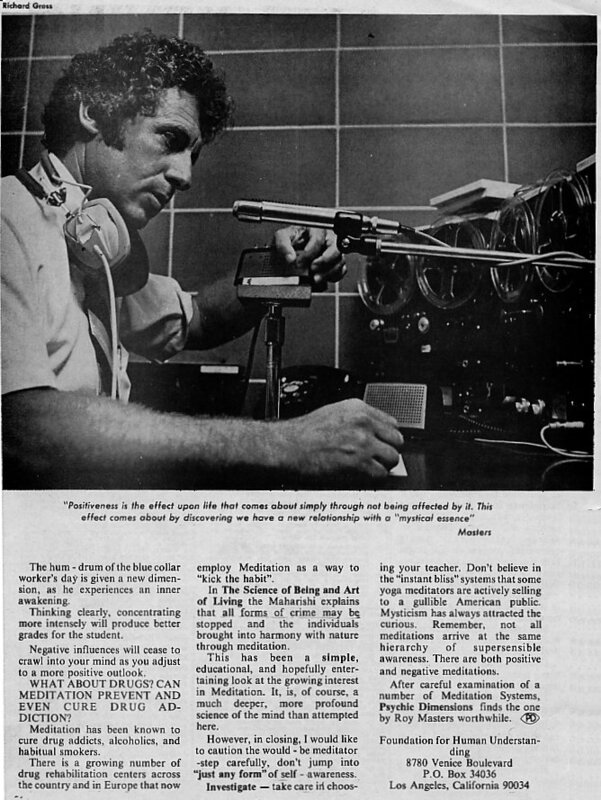 In Los Angeles, California, a man by the name of Roy Masters ("Foundation for Human Understanding") conducts a calling program, "How Your Mind Can Keep You Well", over Radio Station KTYM. His voice gently expresses the virtues he has discovered through transcendent awareness . … the emotions of guilt and anxiety and the fear of repetition go to work on you. Guilt, anxiety, fear: these are the emotions that drive you away from yourself because you cannot face them and cope with them. So you seek distraction, something to relax you, like tobacco, alcohol or drugs …"
Master's form of meditation blends together the advanced psychology of today with Judaeo-Christian technique of yesterday. Thus he provides a simple, understandable form of meditation for the Western mind. The Tantric Yoga method of Meditation is still another system which advocates body control (the practice of Asanas) and breath control (the practice of Pranayama) as essential for calming the beginners mind. 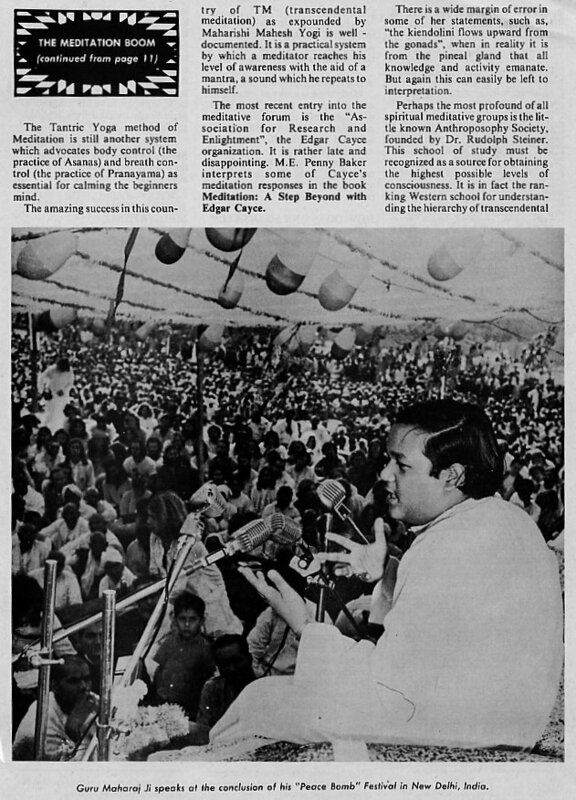 The amazing success in this country of TM (transcendental meditation) as expounded by Maharishi Mahesh Yogi is well documented. It is a practical system by which a meditator reaches his level of awareness with the aid of a mantra, a sound which he repeats to himself. The most recent entry into the meditative forum is the "Association for Research and Enlightment", the Edgar Cayce organization. It is rather late and disappointing. M.E. Penny Baker interprets some of Cayce's meditation responses in the book Meditation: A Step Beyond with Edgar Cayce. There is a wide margin of error in some of her statements, such as, "the kiendolini flows upward from the gonads", when in reality it is from the pineal gland that all knowledge and activity emanate. But again this can easily be left to interpretation. Perhaps the most profound of all spiritual meditative groups is the little known Anthroposophy Society, founded by Dr. Rudolph Steiner. This school of study must be recognized as a source for obtaining the highest possible levels of consciousness. It is in fact the ranking Western school for understanding the hierarchy of transcendental knowledge. So, it can be clearly seen that there are literally hundreds of schools of meditative thought, and their numbers are growing daily. Meditation is a way of opening to an individual the hidden knowledge of a higher level of consciousness. It is an awakening, a rebirth of you, achieved through self - awareness and understanding. It is not a religion, and it is quite natural to man. The fact of the matter is that it was a common practice at one time. There are as many kinds of meditation as there are meditators. No two people have the exact same experience. Two of the more successful techniques are those taught by Roy Masters ("Foundation for Human Understanding") and Maharishi Mahesh Yogi (TM). Unlike the Indian systems of meditation, the Masters technique requires no formal posture, though he suggests for the beginner a straight- backed chair and an upright position. This is to prevent the pupil from slipping off to sleep. You should be comfortable enough to sit still for twenty or thirty minutes. Both feet should be flat on the floor. Close your eyes. Allowing one hand to hang limp at your side. Masters suggests you bring the powers of consciousness to each of the fingers. This is followed by raising the hand to the center of the forehead. You must concentrate on the hand. If your mind should wander, you bring it back to the hand. TM's technique, like Masters', is easy. The only stipulation here is that it must be learned from the Maharishi himself. It might be well to mention at this point that the Maharishi does not feel the process can be learned from books, while Masters' considers that it can. A trained instructor gives the pupil a specific sound, called a "mantra". This mantra has no meaning to the meditator, but the quality is conducive to producing in him "deep rest and refined awareness characteristic of TM". A person attends two introductory lectures, then has an interview with a teacher; finally the actual course of instruction begins. It consists of four one-and-a-half-hour sessions over a period of four consecutive days. "The four day course provides an individual with sufficient knowledge and experience to meditate on his own, but he is urged to have his meditation periodically checked by a qualified guide…"
WHAT DOES THE BODY EXPERIENCE DURING MEDITATION? While in a meditative state, the body is placed in restful relaxation. The "slow" alpha waves increase in intensity. Oxygen intake is sharply reduced. Blood lactate produced in the muscle tissue drops three times faster than in an ordinary state of rest. Skin resistance becomes shallower, less animated as the body, now in a restful, relaxed state, no longer needs as much oxygen. Meditation is a deeper level of rest than that experienced during deep sleep. WHAT ABOUT BIO CHEMICAL REACTION? Reaction is common to many of the meditative systems. As the body cleanses itself, you will experience changes in nutritional and digestive habits, as well as other bio chemical functions. WHAT TAKES PLACE IN THE MIND DURING ALTERED STATES OF CONSCIOUSNESS? (This question is more often asked than any other on the subject, and so seldom answered). An incredible variety of things takes place as you become a "spectator" before an unfolding world of supersensible awareness. You may see around you an open dimensionless space through which a continual movement of geometric forms takes place. Eventually you'll see a white light. This is the light of truth. Supressed past experiences will arise, and you may find yourself reliving them mentally, emotionally and physically. You will materialize many hidden vistas that you were totally ignorant of in the sense world. You may be pleasantly surprised at their appearance. HOW OFTEN SHOULD ONE MEDITATE? Both Masters and the Maharishi suggest that one meditate for at least twenty or thirty minutes twice each day. They recommend it be done upon rising in the morning and before drifting off to sleep at night. If circumstances do no permit this, choose any time when you can be alone and completely quiet. . You should try practicing at approximately the same times each day. If you meditate daily (no skipping) you will produce a fuller control over your sense world. Physically, you'll have more ENERGY! Roy Masters says, "You will accomplish many times the amount of work in any given period than was your custom; yet you will have the strange feeling that you have not done any work at all." Reaction time is increased by about 20% - a good edge for any athlete, especially on a hockey rink or football field, where split seconds count. Your general health will improve as you build up resistance. You'll have fewer colds and experience fewer headaches. Asthmatic patients will enjoy a decrease in allergic reaction. If you're overweight, meditation just might help you melt those excess pounds away. Insomniacs will sleep better. Fatigue will disappear. Important, too, is the reduction in stress, strain and anxiety at the emotional level. Meditation causes a gentle relaxation which affects a marked reduction in everyday tensions. Understanding yourself a bit better prevents the accumulation of tensions. Through self-control you gather strength to cope. Businessmen will find that they can think more clearly, and this, of course, allows for better decision making on their part. Housewives will find that the baby's crying is less irritating. The hum-drum of the blue collar worker's day is given a new dimension, as he experiences an inner awakening. Thinking clearly, concentrating more intensely will produce better grades for the student. Negative influences will cease to crawl into your mind as you adjust to a more positive outlook. WHAT ABOUT DRUGS? CAN MEDITATION PREVENT AND EVEN CURE DRUG ADDICTION? Meditation has been known to cure drug addicts, alcoholics, and habitual smokers. There is a growing number of drug rehabilitation centers across the country and in Europe that now employ Meditation as a way to "kick the habit". In The Science of Being and Art of Living the Maharishi explains that all forms of crime may be stopped and the individuals brought into harmony with nature through meditation. This has been a simple, educational, and hopefully entertaining look at the growing interest in Meditation. It is, of course, a much deeper, more profound science of the mind than attempted here. However, in closing, I would like to caution the would-be meditator -step carefully, don't jump into "just any form" of self-awareness. Investigate - take care in choosing your teacher. Don't believe in the "instant bliss" systems that some yoga meditators are actively selling to a gullible American public. Mysticism has always attracted the curious. Remember, not all meditations arrive at the same hierarchy of supersensible awareness. There are both positive and negative meditations. 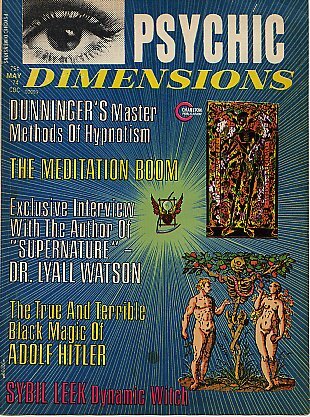 After careful examination of a number of Meditation Systems, Psychic Dimensions finds the one by Roy Masters worthwhile.